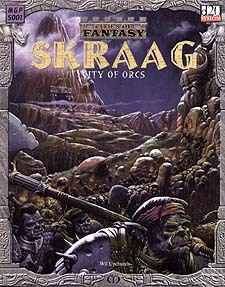 Home to over twenty-five thousand rampaging orcs, Skraag is a city of pure brutality, a place of nightmare than even the breavest adventurer will fear to tread. Built from the ruins of an ancient dwarven stronghold the orcs themselves destroyed, the hordes of Skraag range for miles in every direction, bringing slaughter and misery to any community unfortunate enough to be within range of their predations. * City History: Discover how the dwarves of Ironhallow Hall lost their home in a dramatic battle with the orc hordes. * Government: Despite being run by orcs, Skraag has a convuluted government with several factions all vying to wrest control from the warlords and City Master. * Daily Life: For most of the orcs and goblins that dwell within Skraag, life is a misery beset by poverty and brutality. Yet they continue to thrive, posing an ever present threat to every civilised nation within range of the rampaging hordes. * Religion: The gods of Skraag hold sway over vast segments of the unruly population, their priests guiding the hordes into predetermined paths to serve, and as yet, hidden purpose. * Tour of the City: Walk the burnt out streets and dank caverns of Skraag, avoiding the most dangerous regions in an effort just to survive in this most violent of civilizations. * Movers and Shakers: Full details are given on the inhabitants of Skraag, from the barkeep Gireous Phlog, through to the infamous City Master Cylus Groon and the Demon Lord Kharkus. Watch orcs rise through the ranks of the Silver Tusks and spread throughout the Disciples of the Asphibyiex or the Mended Ones.